Meeting rooms and their technologies are evolving at a rapid pace. This webinar explores unique insights into the audience perspective, what elements affect their engagement and the critical factors – including technology - to maximize collaboration environments. 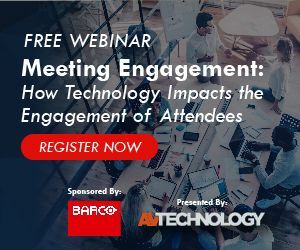 Whether your company has meetings or creates meeting environments – both dedicated meeting rooms and huddle spaces – you will want to hear Barco’s technology collaboration expert, Lieven Bertier, talk about the factors critical to conducting successful meetings and engaging participants. We’ll also have a little fun exploring some data and statistics about what makes meetings productive.